The frame is typically made from welded aluminium or steel (or alloy) struts, with the rear suspension being an integral component in the design. Carbon fibre, titanium and magnesium are used in a few very expensive custom frames. The frame includes the head tube that holds the front fork and allows it to pivot. Some motorcycles include the engine as a load-bearing stressed member; this has been used all through motorcycle history but is now becoming more common. Oil-in-Frame (OIF) chassis, where the lubricating oil is stored in the frame of the motorcycle, was used for Vincent motorcycles of the 1950s, and for a while during the 1970s on some NVT British motorcycles. It was widely unpopular and generally regarded as a bad idea at the time. Today it is a used on some "thumpers" (single-cylinder four-strokes) that usually have dry-sump lubrication requiring an external oil tank. It has since gained some cachet in the modern custom bike world too because of the space savings it can afford and the reference to an earlier era. A motorcycle fork is the portion of a motorcycle that holds the front wheel and allows one to steer. For handling, the front fork is the most critical part of a motorcycle. The combination of rake and trail determines how stable the motorcycle is. Almost all commercially available motorcycles are driven by conventional gasoline internal combustion engines, but some small scooter-type models use an electric motor, and a very small number of diesel models exist (e.g., the USMC M1030 M1 version of the Kawasaki KLR650 and the Dutch-produced Track T-800CDI). The displacement is defined as the total volume of air/fuel mixture an engine can draw in during one complete engine cycle. In a piston engine, this is the volume that is swept as the pistons are moved from top dead centre to bottom dead centre. To the layperson this is the "size" of the engine. Motorcycle engines range from less than 50 cc (cubic centimetres), commonly found in many small scooters, to 5735 cc, a Chevrolet V8 engine, currently used by Boss Hoss in its cruiser style motorcycle. Motorcycles have mostly, but not exclusively, been produced with one to four cylinders, and designers have tried virtually every imaginable layout. The most common engine configurations today are the single and twin, the V-twin, the opposed twin (or boxer), and the in-line triple and in-line four. A number of others designs have reached mass production, including the V-4, the flat 6-cylinder, the flat 4-cylinder, the in-line 6-cylinder, and the Wankel engine. Exotic engines, such as a radial piston engine, sometimes appear in custom built motorcycles, though two firms Megola and Redrup put radial-engined motorcycles into production. As applied to motorcycles, two-stroke engines have some advantages over equivalent four-strokes: they are lighter, mechanically much simpler, and produce more power when operating at their best. But four-stroke engines are cleaner, more reliable, and deliver power over a much broader range of engine speeds. In developed countries, two-stroke road-bikes are rare, because—in addition to the reasons above—modifying them to meet contemporary emissions standards is prohibitively expensive. Almost all modern two-strokes are single-cylinder, liquid-cooled, and under 600 cc. In November 2006, the Dutch company E.V.A. Products BV Holland announced that its diesel-powered motorcycle, the Track T-800CDI, achieved production status. The Track T-800CDI uses a 800 cc three-cylinder Daimler Chrysler diesel engine. Other manufacturers, including Royal Enfield, had been producing diesel-powered bikes since at least the 1980s. Also, Intelligent Energy, a British alternative-fuel company, is developing a motorcycle powered by a detachable hydrogen-powered fuel cell, which it calls an Emissions Neutral Vehicle (ENV). According to reports, the vehicle can sustain speeds of 50 mph (80 km/h) while making virtually no noise, and can run for up to four hours without refueling. Most modern motorcycles have a sequential manual transmission shifted by a foot lever. Some motorcycles, and many scooters, use a continuously variable transmission. Other types of automatic transmission and semi-automatic transmission are also in use. Chain drive uses sprockets and a roller chain, which requires both lubrication and adjustment for elongation (stretch) that occurs through wear. The lubricant is subject to being thrown off the fast-moving chain and results in grime and dirt build up. Chains do deteriorate, and excessive wear on the front and rear sprockets can be dangerous. In a chain drive the power is transmitted into the real wheel via a cush drive. Conventional roller chain drives suffer the potential for vibration, as the effective radius of action in a chain and sprocket combination constantly changes during revolution. If a drive sprocket rotates at constant RPM, then the chain (and the driven sprocket) must accelerate and decelerate constantly. Most chain-driven motorcycles are fitted with a rubber bushed rear wheel hub to eliminate this vibration issue. Virtually all high-performance racing motorcycles use chain drive. A belt drive is still subject to stretch but operates very quietly, cleanly, and efficiently. However, belt drives are limited in the amount of power they can transmit. A toothed belt is frequently used. A shaft drive is usually completely enclosed; the visual cue is a tube extending from the rear of the transmission to a bell housing on the rear wheel. Inside the bell housing a bevelled gear on the shaft mates with another on the wheel mount. This arrangement is superior in terms of noise and cleanliness and is virtually maintenance free, with the exception of occasional fluid changes. However, the additional gearsets are a source of power loss and added weight. A shaft-equipped motorcycle may also be susceptible to shaft effect. The wheel rims are usually steel or aluminium (generally with steel spokes and an aluminium hub) or mag-type cast or machined aluminium. Cast magnesium disks, produced by one-step hot forging from magnesium alloys ZK60 and MA-14, are also used for many motorcycle wheels. At one time, motorcycles used wire wheels built up from separate components, but, except for dirtbikes, one-piece wheels are more common now. Performance racing motorcycles often use carbon-fibre wheels, but the expense of these wheels is prohibitively high for general usage. Motorcycles mainly use pneumatic tires. However, in some cases where punctures are common (some enduros), the tires are filled with a "mousse" which is unpunctureable. Both types of tire come in many configurations. The most important characteristic of any tire is the contact patch, the small area that is in contact with the road surface while riding. There are tires designed for dirtbikes, touring, sport and cruiser bikes. Dirtbike tires have knobbly, deep treads for maximum grip on loose dirt, mud, or gravel; such tires tend to be less stable on paved surfaces. Touring tires are usually made of harder rubber for greater durability. They may last longer, but they tend to provide less outright grip than sports tires at optimal operating temperatures. The payoff is that touring tires typically offer more grip at lower temperatures, meaning they can be more suitable for riding in cold or winter conditions whereas a sport tire may never reach the optimal operating temperature. Sport/performance tires provide amazing grip but may last 1,000 miles (1,600 km) or less. Cruiser and "sport touring" tires try to find the best compromise between grip and durability. There is also a type of tire developed specifically for racing. These tires offer the highest of levels of grip for cornering. Because of the high temperatures at which these tires typically operate, use on the street is unsafe because the tires will typically not reach optimum temperature before a rider arrives, thus providing almost no grip en route. In racing situations, racing tires would normally be brought up to temperature in advance by the use of tire warmers. Front brakes are generally much more effective than rear brakes: roughly two thirds of stopping power comes from the front brake—mainly as a result of weight transfer being much more pronounced compared to longer or lower vehicles, because of the motorcycle's short wheelbase relative to its center of mass height. This can result in brake dive. 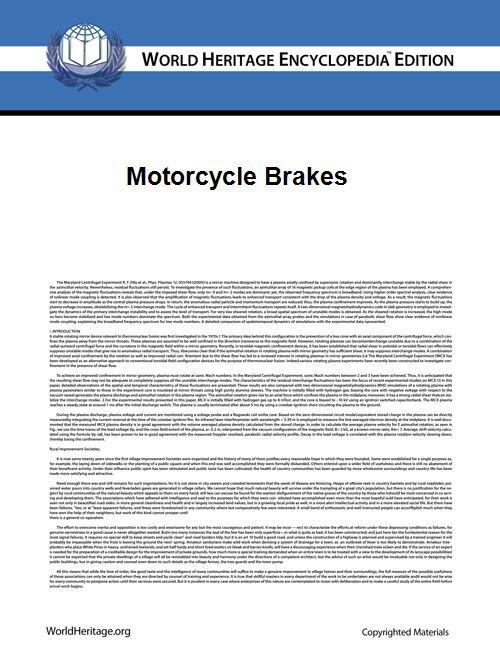 In 1981, BMW introduced an antilock braking system (ABS) on a motorcycle. Other manufacturers have since also adopted this technology, although Harley Davidson only offers it on some police motorcycles and not on civilian motorcycles. ABS is normally found on motorcycles of 500 cc or greater engine capacity, although it is available on motor scooters down to 49 cc. Most road motorcycles have an instrument panel, usually consisting of speedometer, odometer and tachometer. Fuel gauges are becoming more common, but traditionally a reserve tank arrangement is used with a petcock (petrol tap) on the side of the motorcycle allowing the rider to switch to a reserve fuel supply when the main fuel supply is exhausted. There is not actually a separate reserve tank: The intake for the petcock has two pipes, one extending higher into the fuel tank than the other. When fuel no longer covers the longer pipe the engine will lose power/splutter and the rider switches the petcock to the "reserve" setting, which accesses the shorter pipe. Riders whose bikes lack a fuel gauge (most machines prior to the past few years) usually learn how far they can go with a full tank of fuel, and then use a trip meter if available to judge when they must refill the tank.